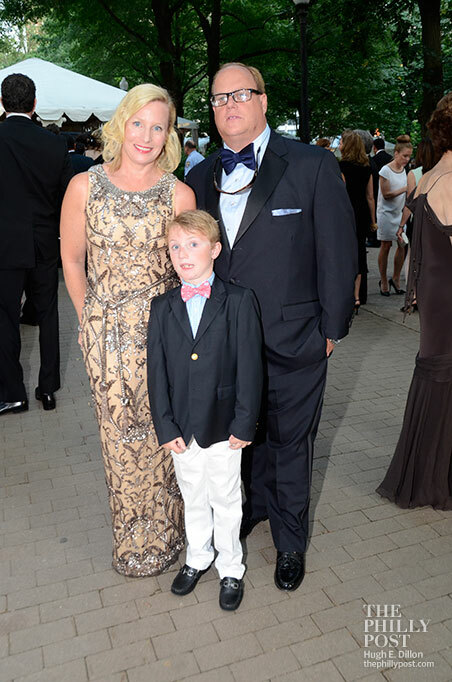 It was a perfect night for the gala's double anniversary year. Plus: Young Friends pics. 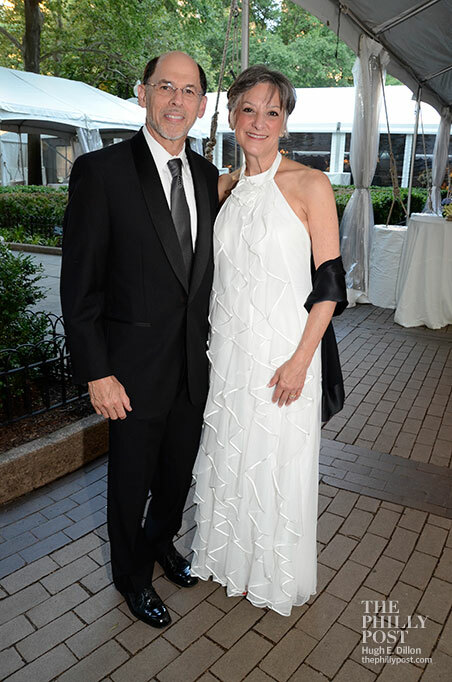 By HughE Dillon·	 6/21/2013, 8:54 a.m.
Last night the Friends of Rittenhouse Square held their 30th annual event in the center of the park — a gala celebration benefiting the upkeep and restoration of one of Philadelphia’s gems. This year’s event was extra special: Not only was it the 30th ball, but it also marked the 100th anniversary of Paul Cret’s elegant design. 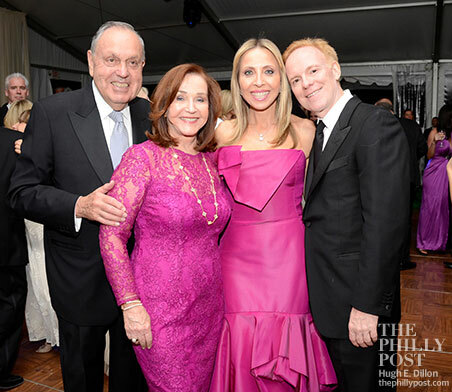 And this year’s ball — hosted by Mary Parenti and Rich Castor and Lynn and Howard Shecter, who did a magnificent job — was the first in which the tent extended eastward to cover the famed Duck Lady fountain. 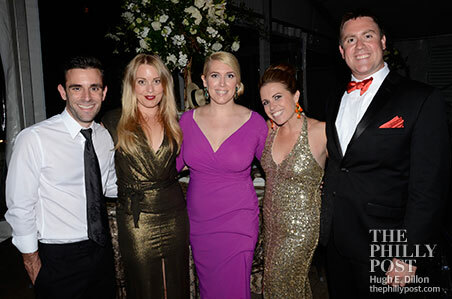 Below: Before heading to the Ball, I attended a pre-party at the home of Erin Elmore and Craig Spitzer, which overlooks the Square. Here, Nicole Cashman, Lauren Colabelli, Sabrina Tamburino Thorne, Tempa Berrish, Erin Elmore with son Royce Spitzer, Carol Tamburino, and Kristin Foote. Below: As I entered the reception area, I spotted a very glamorous Sharon Pinkenson greeting Babs Synder with “Welcome to the party of the season!” And she’s right — this is the party that caps off our very active and glamorous social season. 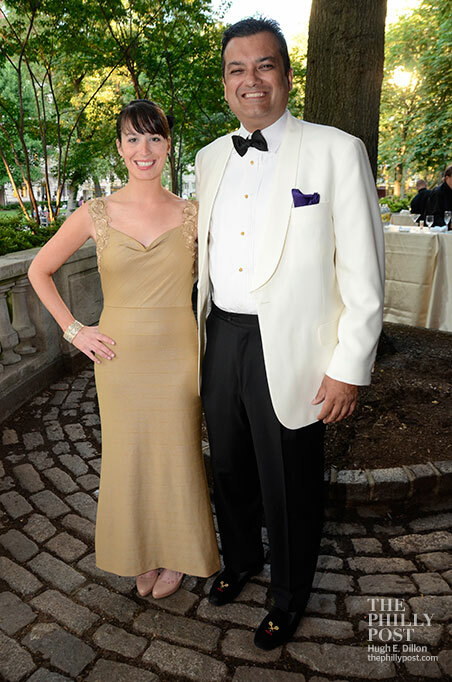 After the Rittenhouse Ball, the social set traditionally heads to the Shore with their garden attire, white pants, and seersucker suits, until it starts all over again in September. Below: Pink, pink, pink! The color of season is no longer the orange fashion mavens heralded at last fall’s New York Fashion Week. I love this very lively color, which just screams spring. 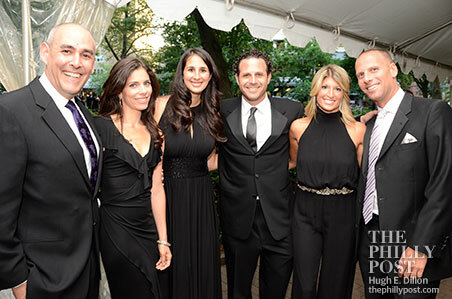 Here, Fred A. Shabel, vice-chairman of Comcast-Spectacor, and Irene Schabel with gala co-hosts Mary Parenti and attorney Rich Castor. Below: Betsy Hummel, president of the Friends of Rittenhouse Square, and Holden Hummel with son Holden Hummel, Jr. Betsy says that in planning for this anniversary year, the Friends realized that no greater tribute could be paid to Paul Cret’s brilliant design than to restore it and protect it from future harm. This year they’ve kicked off a campaign to save balustrades and urns, and will be installing more security cameras and lighting. Look for the statues around the park to be lit, too. Below: David Schwartz and Pennsylvania gubernatorial candidate Allyson Schwartz. Cocktails began at 7 p.m., followed by dinner at 8, and then dessert and dancing commenced at 10. 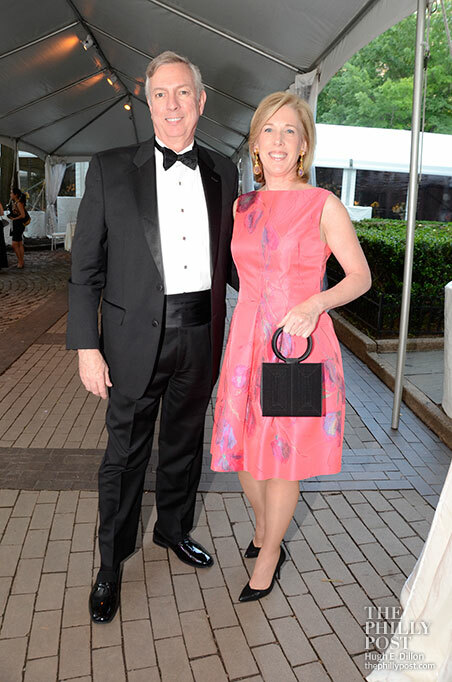 Event attire was black-tie optional, and the evening included a silent auction featuring one-of-a-kind packages created exclusively for the ball. Below: Black is always in: Rob and Maggie Wasserman (Rouge, 500ºF, and the St. James), Richard and Ariel Bronstein, Nina Tinari, and Michael Schulson (Sampan, Izakaya, and the St. James). Below: Kate Slattery and Doc Parghi. Kate, who works at the Barnes Museum, tells me that Ron Wood from the Rolling Stones strolled into the Barnes on Wednesday with his girlfriend and enjoyed a tour of the beautiful collection. Before leaving, he thanked the staff and left enough tickets for them all to enjoy tonight’s show. Below: Larry McMichael and Trish Wellenbach. Trish tells me her bag is N.Y. vintage, and that she’s had it for a while — she found it while closet shopping. Below: Emcees for the night were CBS3 anchors Chris May (who had to leave the event to helm the 11 p.m. news) and Erika von Tiehl, here with Charles Kincaid. I love that the Duck Lady, behind them, has a bouquet of white flowers in her hand. Below: Ben Cross and NBC10 anchor/reporter Rosemary Connors. It will be an early night for her tonight — she recently started anchoring the NBC10 weekend morning news. 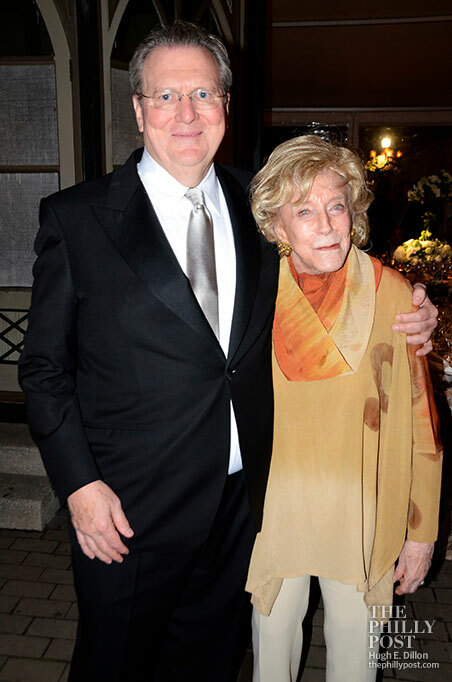 Below: Richard Vague and Suzanne Roberts. Below: Speaking of news, in less than two months Fox 29 producer Alissa Ingram and fiancé Tony Frick will be married. 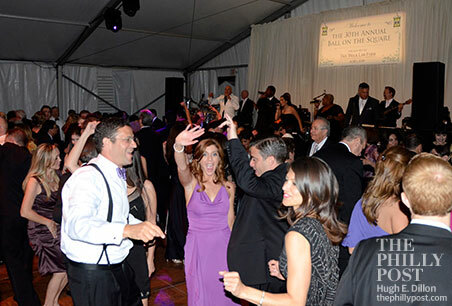 Below: The dance floor officially kicked off at 10 with Eddie Bruce striking up his Orchestra for the 30th time in his career with the Rittenhouse Ball. The floor was jumping like this for the next two hours. Thanks to my dance partners Lexi Norcross and Leah Kauffman for my dance-off — so fun. Below: Daniel Levine and Llana Waber enjoyed themselves at the Young Friends Party, which was held at the Dandelion this year. At 10, the Young Friends joined the main party in the Square for dessert and dancing. The Young Friends chairs were Margaux Genovese-Pelegrin and Joanna Stott. Below: Randyl Case, marketing manager at Citrin Cooperman, and Haley Samsi, retail broker at Fameco Real Estate. 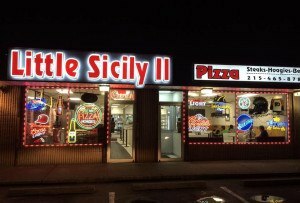 Below: Around midnight I caught Brad Guidi, Amy Guidi, Katie Griffin, Megan McDonald, and Vin O’Neil about to call it a night. 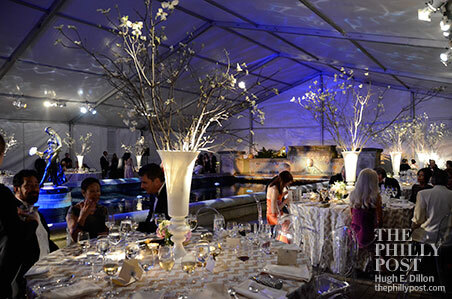 They told me they really liked the glamorous feel of the night, the beautifully decorated Evantine tables, and Eddie Bruce, and were happy that proceeds from the ball go to the restoration and upkeep of one of their favorite parks.